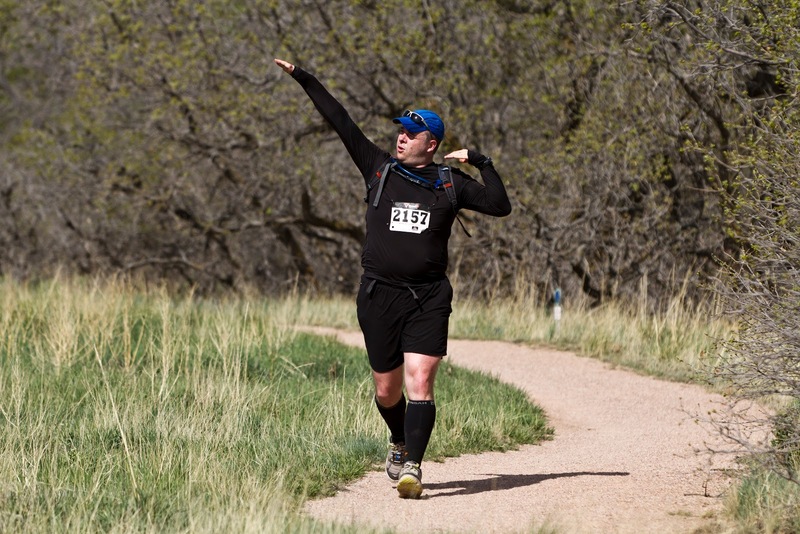 AKA the Top Ten Things I Learned from Repeating as DFL at the Cheyenne Mountain 50k. As usual, this race report consists of the short-short version and the unnecessarily long version. Here goes the short-short version. I ran the Cheyenne Mountain 50k for the second time. I finished DFL for the second straight year. And now for the details. I'll probably break the race report up into phases. I think most of my ultra marathons have had similar phases that are characterized by similar feelings and thoughts. Perhaps you can relate. I signed up for what? When? Is that today? No really. Seriously. I paid money to go do this? Got up early with teh wifey to go make the trek to Cheyenne Mountain State Park. This would be teh wifey's first dance over the 26.2. I had supreme confidence in her and her ability to have a great race. She has a long history of loving running, winning races, and just being a very talented runner. I have a long history with Twinkies. I also had my usual assortment of doubts. Could I finish? Could I go a couple of hours without puking? Would the pink fanny pack consume me? Nevertheless we got there, it was a bit cold, but shaping up pretty nicely. We met up with my Leadville buddy who was looking to smoke the course this year. At the registration table I overheard a familiar blogger's name who I frequently stalk and introduced myself. Then to round out the meet and greet we ran into the fabulous race director Andrea who gave us a big hug and welcome. I informed Andrea that I was back to defend my DFL (Dead *!$%ing Last) title. We got the pre-race briefing and lined up. Everything was going perfectly. Then the running started. The first part of the course goes up. Then up some more. I started at the end of the line and tried to enforce my personal rule of "Never Ever Ever Pass Someone". There really is no point. Whenever I feel compelled to pass someone I go crazy and think I need to speed up so much that they never catch up to me. Which of course they will and then they will pass me. It's much easier to just avoid the soul-crushing disappointment. It's also better not to think about the fact that you have 28-29 more miles to go. It doesn't help. I knew last time I had gone out way too fast. I thought if I "started slow and got slower" I would have a chance to hit eight hours or so. Ridiculously slow? Yes. Committed to the strategy? Yes At least until I hit the 5k mark in 44 minutes. Then I freaked out. Then I got rambunctious. I had been rambling along nice and easy along with another lady who wound up finishing and doing very well. However when I hit the 5k mark in that slow of a time I panicked. I started thinking crazy thoughts. "I've got to pick up the pace or I'll never make it." "I'm going to collapse on the second lap, I've got to bank some time!" "I really missed my calling as a Soul Train dancer!" So I forgot all about my strategy and plan and started booking it along the Blackmer section of the trail. The technical term for this reaction is, dumb. I was bombing downhills, even sneaking in some running up hills and made great time. And wasted a ton of energy way too early. I finished the next 4-5 miles way too fast. At three hours in I had my first krakatoa moment (see shouting at shoes) and knew I had just ignored my hydration strategy while being consumed with making time. Good job, now it's time to pay for your mistakes. Phase 4: Have I Ever Mentioned How Much Fun it is to Have the Runs while Running? The only thing I will say about this is that I have postulated a running maxim which in my humble opinion I find to be universally true. You can call it the Streak Run maxim. (OK maybe it needs a different name.) The distance a runner will go off the trail to find a "private" location to do one's business is inversely proportional to the time they have been running. In other words by the time you hit mile twenty, you're lucky if you make it off the center of the trail. Moving on. I inevitably hit this point. In some races I hit it multiple times. It is that point where I am mentally defeated. I don't want to keep trying. I don't want to keep running. I may even consider wearing a black belt with brown dress shoes. I just don't care. Even before the first 15.5 mile lap of two was completed I was ready to be done. I didn't want to start the second lap. I started to rationalize the excuses. Probably due to some encouragement from a volunteer I knew from last year and from the RD when I got to the point of starting the second lap I just kept going. I have no idea why. But I did. I still was rationalizing. I thought at least I will have made it 22 or 23 miles. That's good, right? Better than nothing? This puking is getting old. The "running" is getting REAL old. I have incredibly bad blisters already which I don't normally have. Quitting is perfectly fine right? If I slow down enough on this section I won't even make the 3pm cutoff, then I won't be quitting I will just be stopped. This was my mental state when I turned the corner and saw the love of my life coming towards me on the trail. I waddled up the trail and gave a big smile to teh wifey. Instantly my thought process changed. She was looking like she was struggling and I wanted to do whatever I could to encourage her and keep her moving. I stopped thinking about myself and got to think about someone else, MUCH better. I believe the three weeks of sickness she was still recovering from was causing real problems for her. I'd like to think I uttered some sort of Knute Rockneyesque Gipper speech which propelled her on to the finish. It was probably more like a grunt and a "YOU CAN DO IT!!!!!" Needless to say she gutted through it and finished well. It was the last time I would see her until the finish. It was at that point that I had a bit of a mental breakthrough. There was something about giving some encouragement that made me think differently about things. The mantra I had discussed with teh wifey going into this race was "Whatever it takes" Whatever it takes to finish. And so I asked myself, what if? What if instead of slowing down I got back to running? What if instead of saying I can't do this, I can't make this, I said, I can? What if instead of creamy, I mixed in a little super chunk? I'm just saying. I figured in my mind how much time I had before the nine hour cutoff. I knew it was going to be tight. I had wasted a bunch of time and every time there was an option to run or walk I would need to run. Every time there was an option to bomb it down a hill, or wince from blisters and thrashed quads I would need to bomb. Every time I had the option to mix in some interpretive dance in a business meeting, I would need to nail the Anton Artaud. So I did. Every time. For the next five hours. Phase 7: The Part Where I Keep Asking, Why Are You Running? It is perhaps a bit strange to dramatize the insanely slow waddling of an extreme back of the pack wannabe ultramarathoner, but then again why not? I must have asked myself a hundred times, "WHY ARE YOU STILL RUNNING?!? JUST STOP!" Normally I would have stopped. Over and over. But I didn't. I wondered whether it would all be for naught. I wondered whether I would crest the final hill only to find myself just a few minutes past nine hours with the finish line packed up again and gone like last year. I wondered if those minutes of puking and uh, other stops would be the final margin. Every second seemed precious. With the help of the fabulous volunteers I sprinted through aid stations like I was in first place and running like I stole something. I gave everything I had. The blisters had grown their own blisters, the puking returned, but I was in this strange zone where I just lowered my head and said "Whatever it takes." Winning these mental battles was a new feeling. It felt good. I came up to the final set of hills and I was still worried. Despite having done the previous loop I couldn't remember how far I had to go. When I hit the last aid station with two miles to go I had far less time than I thought I would have. I had just under thirty one minutes to finish the last stretch. That sounds like a lot, but at that point in the race I was hanging on for dear life and didn't know whether two miles meant 2.0 miles or 2.9999 miles. I went faster. I kept cresting hills hoping for a view of the finish line to know whether this whole day of effort was going to pay off. I just didn't know. Those nagging voices kept suggesting that it was pointless, all this was for naught, you are just wasting all this effort. I took those thoughts out back behind the woodshed with a double-barrel, a shovel, and a bucket of lye and ended the conversation. Finally I reached the last crest. There was literally under ten minutes to go. As I reached it, the RD was there in the sweeping vehicle? and joked, "you know if you had been running you would have gotten here a lot earlier." I grinned. I could see the finish. I was going to make it. Whatever it takes? Oh yeah. I pushed the pace into the finish line. It was still set up! (It's crazy to think your goal is to finish before the tear down is completed, but I don't care, I wanted to run through that stinkin' finish line). I crossed the line, threw my hat in the air, kissed my wife, (she realized I had been puking all day and was somewhat disgusted), I high fived one of the volunteers who had been encouraging me all day long and then did a Kirk Gibsonesque fist pump. Look I know celebrating a DFL is a little bit like celebrating a fluke touchdown when your team is down by 47 points, but I didn't care. I had made it. I had won the mental war. I had done whatever it took. Then I went and puked some more. It was beautiful. 1. I can do this thing. 2. It might take me a long while, but I can do this thing. 3. I wish it didn't take me quite such a long while. 4. Wet wipes are an ultra runner's best friend. 5. Teh wifey is an ultramarathoner! Woot! 6. When your feet are covered with blisters, running feels better than walking. 7. In order to properly secure a DFL you must pace yourself to come as close as possible to the cut-offs. At least, that's my story. 8. I still don't like North Talon. I think I like that sneaky little hill on South Talon even less. 9. Seriously. If you are even thinking about doing an ultramarathon, why in the world wouldn't you do the Cheyenne Mountain Trail Race? It is awesome. Great RD, great volunteers, great organization, great trails. Go do it. Now.